Painting your own home, whether inside or out, can be a little intimidating, not to mention messy. With our advice, guidance, and on-site coaching, you can have confidence that you're getting a professional look with DIY. We'll be there for you through each step of the process. We'll teach you the techniques the pros use, as well as offer advice and assistance throughout your entire project, from set up to clean up! 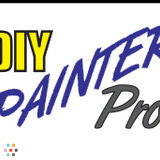 We'll help you get the right products, the right quantities, and the right tools to make your painting project go smoothly. With any painting project, surface preparation is the key to a beautiful, long lasting finish. We'll show you how to accomplish the seemingly never ending task of preparation, with as little time, energy, frustration, and mess as possible. The same goes for the painting itself, which can be quite messy. We'll teach you the methods to apply that expensive liquid you paid your hard earned money for, without worry that you've wasted any bit of it. There are four main stages to the painting process. They include surface preparation, masking, painting, and touch up. We'll be there at the beginning and end of each process to show you the techniques to accomplish them, and to ensure that they are done correctly before moving on to the next stage of your project. We also offer rentals for tools and equipment that aren't feasible to purchase to paint your own home. Give us a call today and learn to paint like a pro! I am motivated sole on, attention to detail. Exceeding the customers expectations and pride in my work. Painting to your likes and needs. Inside or out we will paint or stain it all.